3 races in 3 weeks...and they just kept getting better! This past weekend was the Bakers Dozen 13 hour mountain bike race in South Carolina. It was my first solo attempt (also self-supported), and really it was just training. I went into it expecting to ride for 13 hours at a pace that I could handle for that long. The course was pretty flat, actually, but very rooty! After about 5 laps, the roots started taking a toll on my upper body. I tried to avoid them but on this course that is impossible. My hands and arms hurt more than my legs for the entire race! To my surprise, 11 laps put me in 2nd place for the Solo Female division. That's 88 miles (actually 90+ if you count the extra distance covered by me making a WRONG turn on my 3rd lap..opps!). Eddie finished 1st in the Solo Male category (of course), with 19 laps and 152 miles...almost twice as much as I rode! You're amazing (but I don't need to tell you that ;) The rest of the Arc Angels team was out there (great job everyone!) and the NWGA SORBA race team as well. They were all awesome to race and hang out with. All in all, a great weekend! Update: After the fact, I realize that the roots hurt so bad because my fork was setup wrong..and therefore not really working! Geez?! If it could have gone wrong....it did. 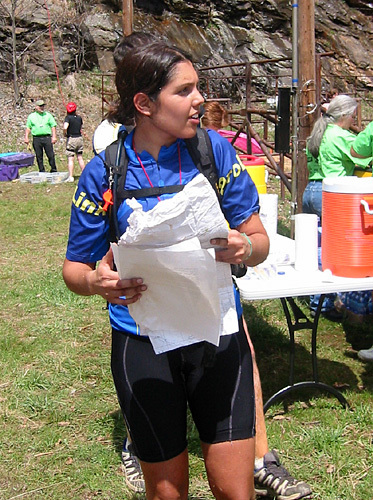 After SMAR was cut short, I decided I felt good enough to do the Blue Ridge Adventure Race. Despite having a cold all week, some general life-related stress, and random teammates that I had never met, I decided to give it a go. All I expected was a fun day of training anyway. Everything was pretty last minute, and I decided to quickly pack my stuff Friday night and drive up Saturday morning at 4am, for the 7am start. Remember learning the "5 P's" in elementary school? Prior Planning Prevents Poor Performance. Well, consider this weekend a reminder of the "5 P's" for me. I got up at 3:30 am, and hit the road by 4:15. I was to meet the rest of team Ron Mexico (Will, Patrick, Erin (support), and Travis (support)) at 6:15 in Blue Ridge. The ride up was foggy and spent dodging animals crossing the road. One opossum was not so lucky. I tried to forget about it and concentrated on relaxing my mind before the race. Once we met, we transfered my gear box and bike to the Support Vehicle. It was pretty chilly as we waited around for the train ride, but we got a chance to catch up with friends. Between the three of us we knew several teams racing that day. At 7:10 we went to board the train. The cars were numbered by team number...so since we registered the night before the race, we were team #85 out of 85. We walked to the back of the train...and then boarded the only UNCOVERED car! All the other teams would be in heated cars with comfy benches, tables, and restrooms. We had to sit outside, freezing our butts off while the train rolled for an hour from Blue Ridge to Cherry Log. Once we got off the train, we ran to the first TA, where we were to pick up our bikes and ride them to the Stanley Gap parking lot. I looked down at my bike, helmet, gloves, and it was at that point that I realized that I had forgotten my bike shoes in my car. My heart skipped a couple beats and I think I almost died. I looked at my teammates with a look of panic and horror...and told them that I had forgotten my shoes. There was absolutely nothing we could do about it as our support crew was long gone. Still feeling very ill, we pulled out the maps and Will and Patrick went to start looking at the directions and checkpoints. I walked over with the UTM plotter and realized that they were not comfortable plotting points. I quickly took over the task as they look over my shoulder. Keep in mind that I have not plotted points by myself or navigated in over a year. I occasionally pay attention to what my teammates are doing while training and racing, but I never take the lead role in navigation. To make things worse, our map was almost useless. Everything was faded, as if there was no toner in the printer when our map was printed. You could barely make out some of the topo lines, creeks, elevation markings, indicator lines, or even the Lake and Toccoa River! I just assumed that everyone's map was just as bad so we just chalked it up as another slight challenge. As soon as I plotted all the points Will says to me, "Well, you look like you know what you're doing, why don't you just navigate". I was still sick to my stomach and don't even know what I blurted out in response. Off we went on the bikes, along with the other teams in tennis shoes on Walmart bikes. Everyone else was long gone. I knew my training compadres and friends were way ahead as they all know this area like the back of their hands. I decided at that point that it was going to be a long race and tried to reinforce to myself that I didn't care about anything at this point except for finishing and getting in a good day of training. Being a competitive person, it was hard to talk myself into believing this but I didn't really have a choice. I pushed myself as hard as I could and we still passed teams despite riding on clipless pedals with my Salomons. We got to CP3 and prepared to run. Will went to the volunteers and asked for our passport and they looked at him like he was crazy. He was told that we should have gotten the passport in our race packet the night before, but nowhere in the packet was a list of contents so Will didn't know that we were even missing the passport. One of the volunteers remembered his face from registration and hand drew a passport while we stood around and waited. I tried to not get frustrated, but it was hard. Patrick put me on the tow, man is he a strong runner! We hit the first couple points with ease, and then my shoelace loop from my Salomons caught a twig or something and launched me to the ground. My knee hit a root hard and it was very painful. I laid there for a couple minutes holding my leg that was already gushing blood. A few teams passed us. I started to get really discouraged at the bad luck we'd already had and it was still early in the race. I somehow talked myself back up into running and we headed on. The next points on the run went by fast and we returned to pick up our bikes. Transitions were fast for me because I didn't have to change shoes! The next bike leg was pretty long, a couple hours at least. We continued to pass teams, despite my feet starting to cramp and become sore from their unnatural position on my pedals. If I had come to the race prepared, we would have killed this section...Will was an excellent mountain biker and Patrick was very fit and good on the bike as well. They were such good sports, though, and we maintained a consistent pace. We arrived to the rappel and our support crew was there. They refilled our packs with food and water while we did the rappel. I am scared of heights and this was only my second time rapelling outside. I asked the volunteer at the top to check my harness for safety and he tugs on it and says "Well, I'm not familiar with these harnesses...but you should be fine". I was thinking to myself, are you kidding me?? Had Will not looked at my harness and ok'd it, I probably would have not gone down the rappel with the volunteer's lack of regard for safety. Long story short, I survived the rappel..again. We continued on foot to the next checkpoints. 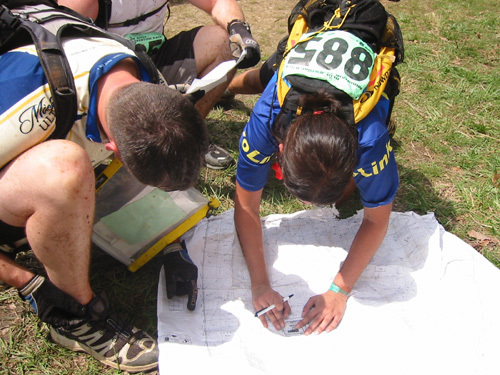 Around CP15 is where things got confusing. Bushwacking was involved from 15-17, and our poor quality map was a big disadvantage to us. I looked at another team's map and it was crystal clear...dark lines, you could actually read everything and make out the terrain features on the map..wow! They were surprised to see what we had been using! This section of the race took about two hours longer than it should have for us. We made the canoe cutoff, and got in the boats. Will and Patrick are both great paddlers so that was good and pretty uneventful. We arrived at the take out, got back on the bikes for a quick but painful 4 miles to the finish. Through all the mishaps, we finished 28th out of 85 teams. I got what I expected...fun and good training. Several of my training partners and friends finished in the top 10, so good for them!! This one definitely gets an "A" for adventure :) Thanks to my teammates for not killing me for my mistake, and thanks to our support crew Erin and Travis! You guys were awesome! This was to be my longest race to date...the Smoky Mountains Adventure Race, 40 hours, 25,000 ft of climbing in 107 grueling miles. I raced with Team Carolina AT/Running Amok (Stephen Morris and Michael Gladden). We arrived Friday afternoon for gear check and the pre-race meeting. The weather was about 40-50 deg. with a constant rainfall. We knew the weather would be wet to start, but was supposed to clear for Saturday and Sunday. Saturday was forecasted as a high of 51, 30% chance of precip, but up to 50 mph gusts of wind. We knew that this would translate to chillier and windier conditions on the ridgelines that we'd be traveling throughout the course. The stategy from the start would be to maintain a constant pace while simply trying to outlast the competitors. We decided that if we were still feeling good on Sunday morning, we would push as fast as we could to try to finish in the top 5-10. We got the maps around 7pm, and Stephen and Michael began plotting the UTMs. We knew that we would be starting at 10pm, with a 17 mile paddle. We estimated this would take us 4-5 hours. 10pm came quick, and we headed out on the water. The paddle was a rogaine format so we chose to get the points clockwise which may have caused us to deal with extra strong headwinds. The conditions were terrible. Whitecaps, furious winds, pelting rain, and extreme cold. Temperatures were in the high 30's, with rain/snow mix, and sustained winds between 10-25 mph and gusts up to 50 mph. We saw some teams capsize also. Luckily the checkpoints were fairly easy to locate once we arrived at each of them. Arriving back to Transition Area 1, I was extremely cold and soaked through and my feet felt like 10 lb. blocks of ice. Michael was slightly hypothermic. We took an extended TA so he could get warm enough to head out on the bikes. The bike leg was 60 miles, and lots of elevation gain. My legs started out slow and took about an hour to finally warm up to riding. After that, I felt great. We had a short break from the rain, but soon after that short break it started to snow. We hit some fun singletrack (fun because it was basically a mud fest). We then caught up to several teams on the forest road ride after that. The weather conditions were quickly deteriorating, and it was snowing about an inch an hour. There were sustained winds of 40-50 mph on the ridgelines, with gusts of up to 70, and 3-5" more snow, with temperatures in the teens, and wind chills less than -20 (in addition to the 6" already on the ground). It would have been easy to quit, as many teams were steadliy dropping out. But thanks to my strong teammates for being willing to continue on. Stephen gave Michael all his extra clothes to wear, and we applied our hand and toe warmers and trucked along. At CP 10 our bikes had frozen up. Drivetrains and brakes were not working. It was very very hard to make the decision to turn back. We were all still feeling strong, but did not want to contend with Mother Nature as nightfall would only make things worse. We had only prepared for the conditions predicted by the weather report...50's and windy, with 30% chance of precip! Right then it wasn't about speed and ego, it was more about survival.